Life and Death as IZ see’s it….From IZ himself. I love it when he says, “Go plant one tree in Kapiolani park, in the middle of the park where they play soccer”. That is just him being kolohe. How true IZ’s words were and SO inline with what the Bible says regaurding the life we have now AND the life we can have later when the New System begins; Revelation 21;3&4, Psalms 37:11&29, and then read what there will be available in the New System for us in Isaiah 65:21-25. 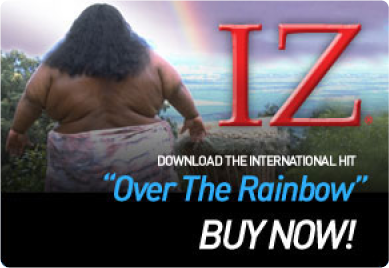 DO YOU WONDER IF YOU WILL SEE AND HEAR IZ AGAIN? It was never a part of the True God’s original purpose for any of us or our Loved one’s to die. Please read; John 5:28&29. Then please read where did Jesus resurrect Lazarus? Please read the entire chapter of 11 in the book of John. After Lazarus died and if Jesus thought he was in a better place why would he bring him back alive onto the Earth? Return to Psalms 37:11&29 and Rev 21:3&4 again, to gain the whole picture. According to God’s word Isreal Kamakawiwo’ole is just asleep in death, please read Ecclesiastes 9:5. It is God’s promise that He Will resurrect those in the memorial tombs to live and be with us again. Everything that Jesus did for us when he walked the Earth was just a small scale of what is to come. We need our faith that these things said will prove to be and then rejoice when they do! ISREAL KAMAKAWIWO”OLE said it all in a short sentence: “We live on both sides, we will see eachother again”! Aloha and Mahalo Nui Loa for listening! Amen, Jessica! True hope and true love from an awesome God! Just think of how happy IZ must be right now!